Look, I'm going to cut right to the chase here: we've done a lot of book giveaways, and in every single case they were quality books written by undisputed experts on the topics. But the book we're giving away here... well, it's on a whole new level, because it's written by an insider: Reto Meier, Google's Android Developer Relations Tech Lead. 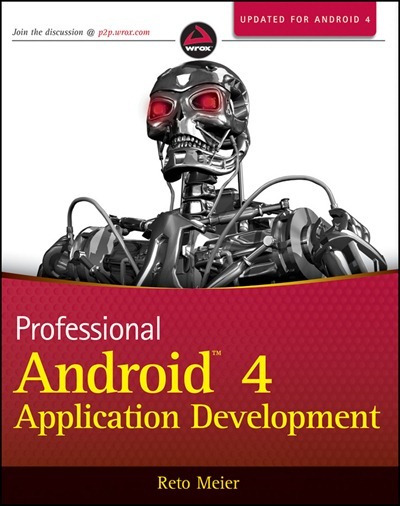 Having been involved in Android development (from the inside, mind you) since the initial release in 2007, it's safe to say there are few people who know more about how best to develop for the OS than him. The book in question is Professional Android 4 Application Development, and it spans a whopping 864 (!) pages, but checks in at an incredibly reasonable $27.38 ($25.64 if you pick the Kindle edition). We've got 10 copies to give away, and to enter, all you have to do is drop us a comment. Any comment will do - just make sure you include your email address in the proper field so that we can contact you if you win. Thanks to publisher Wrox's generosity, the contest is open to anyone in the world, and will end Friday, April 20 at 11:59 PM PST.